Bradford Electric. 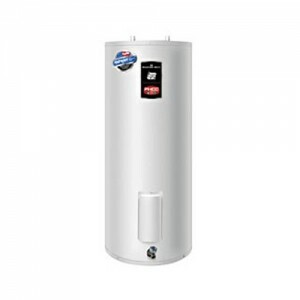 Residential Upright Energy Saver Electric Water Heater. Fully Automatic Controls—Fast acting surface-mount thermostats for automatic temperature control. Factory installed sensitive manual reset energy cutoff for safety to prevent overheating. Direct Heat Transfer With Immersed Elements—Transfers heat directly and efficiently to the water. Screw-in style. Factory Installed Hydrojet® Total Performance System—Cold water inlet sediment reducing device helps prevent sediment build up in tank. Increases first hour delivery of hot water while minimizing temperature build up in tank. Vitraglas® Lining—Bradford White tanks are lined with an exclusively engineered enamel formula that provides superior tank protection from the highly corrosive effects of hot water. This formula (Vitraglas®) is fused to the steel surface by firing at a temperature of over 1600°F (871°C). 2″ Non-CFC Foam Insulation—Covers the sides and top of the tank, reducing the amount of heat loss. This results in less energy consumption, improved operation efficiencies and jacket rigidity. Water Connections— 3⁄4″ NPT factory installed true dielectric fittings extend water heater life and eases installation (M-2-120R has 1″ NPT dielectric waterway fittings). Factory Installed Heat Traps—Design incorporates a flexible disk that reduces heat loss in piping and eliminates the potential for noise generation (Except M-2-120R). Simultaneous and Non-Simultaneous Operation Available— Simultaneous operation indicates when both elements (if equipped) are being heated at the same time. Non-Simultaneous operation indicates when one element is being heated at a time. Voltages Available—120V, 208V, 240V, 277V, 480V. Single Phase or Three Phase Operation Available—277V may only be wired for single phase operation. T&P Relief Valve Included—All models have special tapping on top of tank. Low Restriction Brass Drain Valve—Durable tamper proof design.